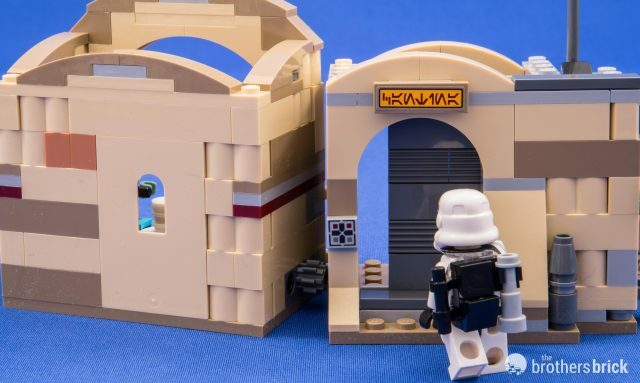 As it begins to arrive, the January wave of LEGO Star Wars sets brings old familiar scenes as well as new ones. Along with numerous vehicles and locations from The Last Jedi, this wave also returns all the way back to 1977 with a new version of the Mos Eisley Cantina. 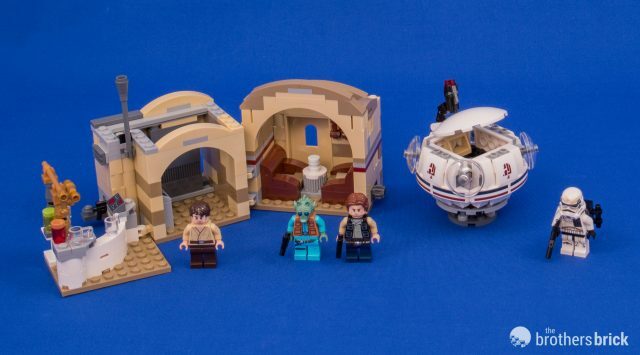 Set 75205 Mos Eisley Cantina includes 378 pieces and comes with a sticker price of $39.99. It’s also the third LEGO version of the watering hole in the galaxy’s most wretched hive of scum and villainy, so we’ll see how it stacks up, both on its own and in comparison to previous versions. The box bears this year’s Star Wars packaging featuring characters from The Last Jedi. As with previous waves, although the artwork is specific to the new film it’s being applied across all the sets, no matter which film they’re from. 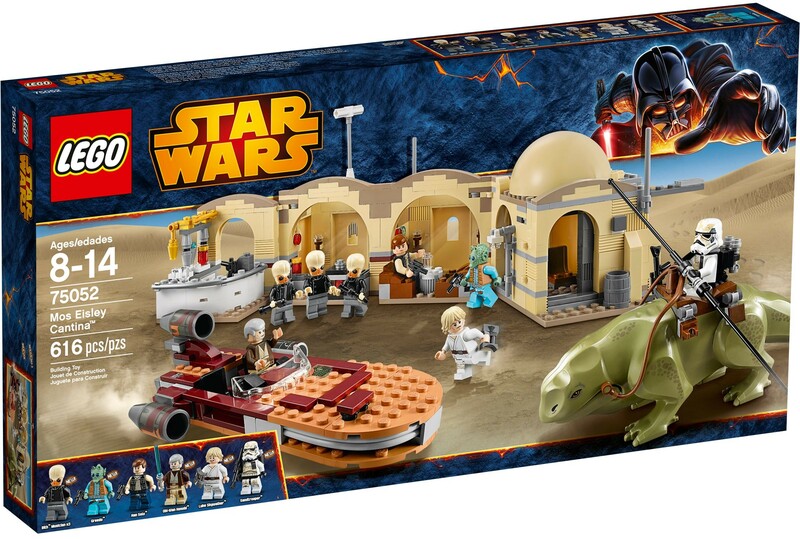 The box front shows the cantina in its Mos Eisley setting, with the landspeeder behind, almost appearing to hover oddly above it like a Roswell flying saucer. As expected, the back of the box shows the various play features. Opening the box reveals the set’s 376 pieces are spread across 3 bags, with the stickers and instruction sheet loose. 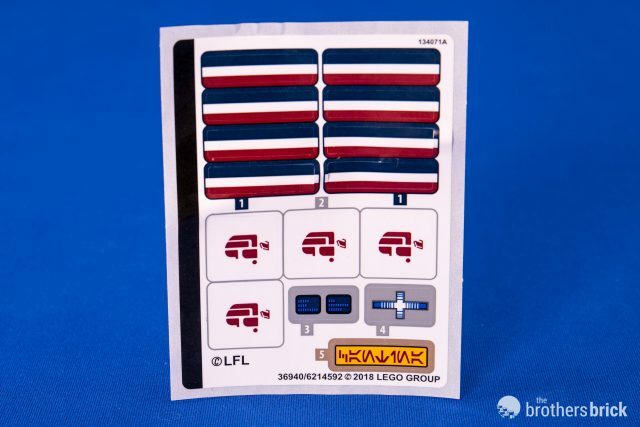 Even without opening the manual, it’s evident that Bag 1 is for the landspeeder, as it contains mostly white elements while other bags are shades of tan and grey. 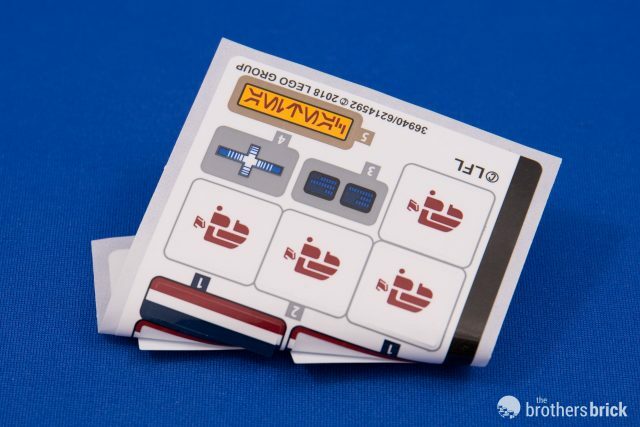 In our recent review of 75202 Defense of Crait, I was pleased with receiving the stickers and instruction manual in their own bag, and I noted that it’s time all LEGO sets do this. As if to highlight my point, this set does not protect the printed materials, and both the instruction manual and sticker sheet plopped out of the box rudely bent in half. The stickers were nearly falling off the sheet. Bag 1 contains all the parts for the landspeeder, which is an Ubrikkian 9000 Z001. To achieve the landspeeder’s spherical pod-like shape, the build starts by surrounding the pilot’s seat with studs pointing in all directions. The 9000 Z001’s landing gear is made with four grey taps. 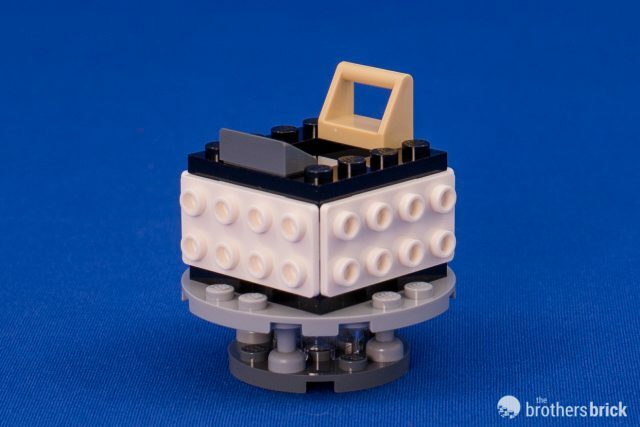 As with most LEGO spheres, it’s really just a cube that’s been covered with slopes. The same three stickers are repeated on each of the four sides, and the windows are attached with ball joints to two of the sides to cover the vertices between the panels. 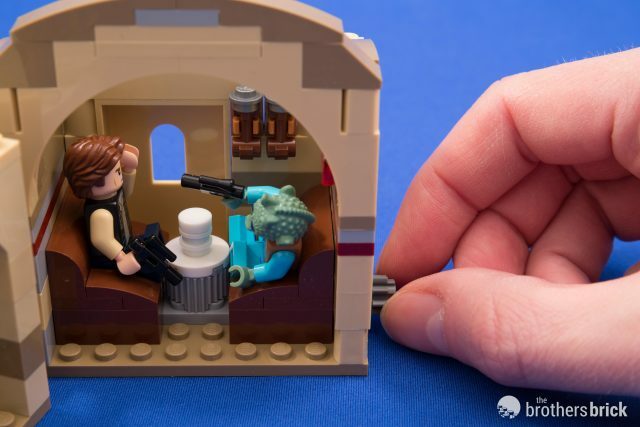 At just eight studs in diameter, it’s a surprisingly small model for having 114 pieces (not counting the blaster’s ammo), or roughly one-third of the set’s elements. The remaining two bags construct the cantina, beginning with the bar. All three sections sit on dark tan plates, and each is a different size. A white modified 1×2 brick with handle connects the bar segment to the entrance segment. This is only the fourth set to include this element in white. Two grey ones are included in the alcove, though that color is less rare. The cantina entrance features a sliding door made possible by a rail in the floor. The walls are a mottled mix of tan, dark tan, and grey, and consist of simple brick stacking. As we mentioned at the start, 75205 Mos Eisley Cantina is the third iteration of this backwater watering hole. 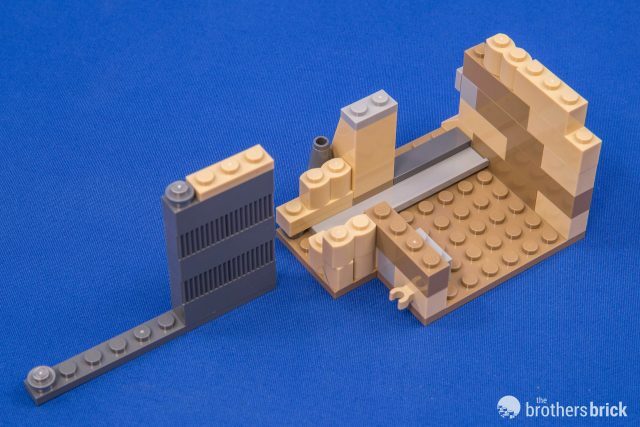 With limited shelf space on retailers’ shelves, LEGO only produces sets for an average of two years before phasing them out so that kids have new options to purchase. However, when it comes to famous and time-tested franchises like Star Wars, new fans discovering LEGO (or Star Wars) always want to be able to buy the iconic ships and locations. 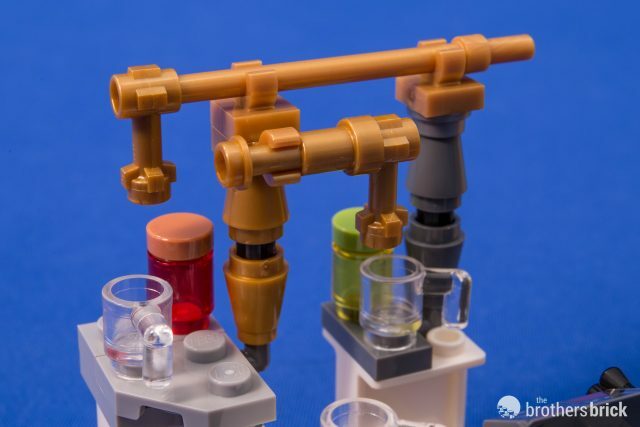 LEGO’s solution is to continually update and refresh vehicles and settings with new designs, new elements, and new details, releasing variations every few years. 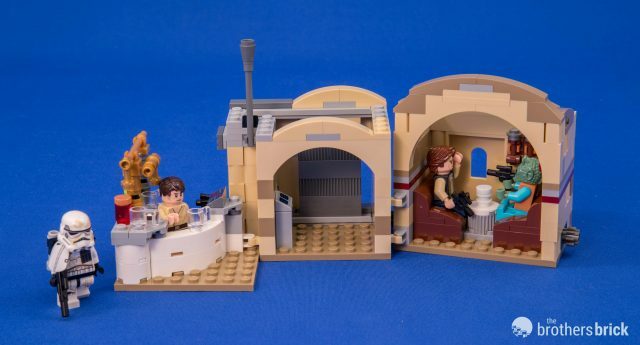 4501 Mos Eisley Cantina in 2004 and 75052 Mos Eisley Cantina in 2014 each included Luke’s X-34 landspeeder, along with a dewback for the Sandtrooper and the alcove where Han and Greedo get down to business (the main constant across all three sets). The part counts for the three versions vary wildly, with the first iteration having a mere 193 pieces, and the 2014 version had 616, leaving the middle slot to the new edition’s 376 pieces. Clearly, the Ubrikkian 9000 Z001 is the most interesting aspect of this set, as it’s the one part that’s never before appeared in a LEGO set. 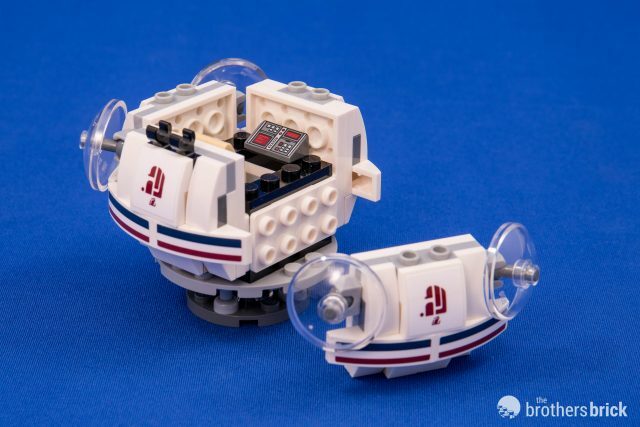 The tiny spherical landspeeder is almost entirely white, with the stripes and markings created with stickers. A few 9000 Z001s appear in Mos Eisley, including one prominently parked outside the cantina. 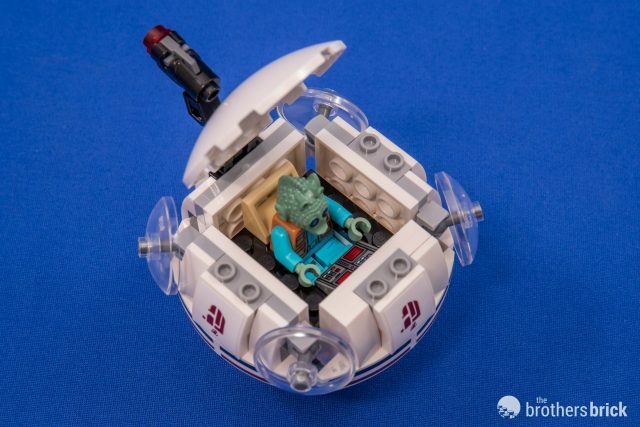 Lore says the ship is Greedo’s, and although that’s not confirmed in any sources that are still canon, LEGO clearly intends this to be his ship and features Greedo piloting it on the box back. The stud-shooter blaster on top of the LEGO model is obviously an inaccurate addition for the sake of play features, but it’s easily removable. This is definitely a case where black would have worked better for windows than clear, as the structure inside the model shows through too much for the 3×3 clear radar dishes to be interpreted as windows. Inside there’s just enough room for one figure. The official specs for the 9000 Z001 list a capacity for one pilot plus two passengers, but the blocky nature of LEGO makes that entirely out of the question. Chalmun’s Cantina is constructed of three sections of the setpiece which have had their sizes and proximity to each other compressed (except for the size of the alcove, which seems about right). The sections come apart, but cannot be rearranged to any other order. Outside, the cantina has a sign which reads Cantina in Aurabesh, along with a small panel of lights for the door lock (a piece generally found in Nexo Knights). 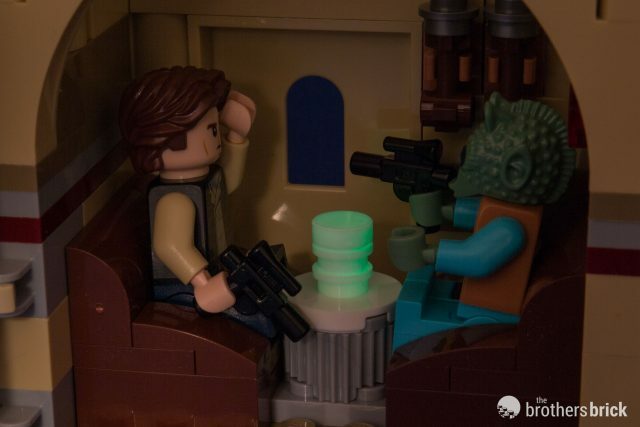 The gear behind Han’s seat in the alcove prevents the sections from abutting smoothly. The bar captures the general aesthetics of the cantina well, but none of the particular details. A number of cups and colored vessels are scattered about, and there’s a small till with a blaster pistol mounted beside it. The large still contraption behind the bar looks better here than in the previous iteration of this set, though sadly it’s merely pearl gold instead of the chrome gold seen on screen. 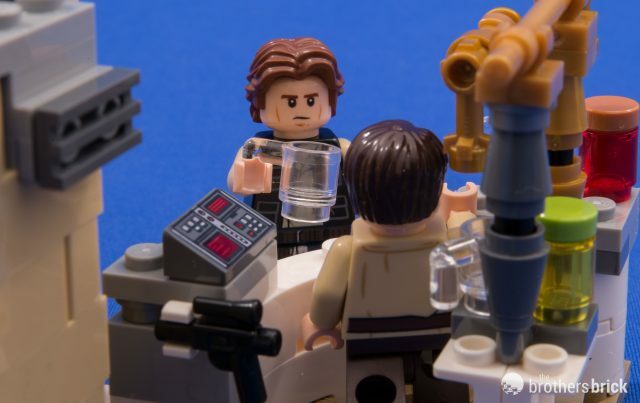 While the bar is large enough for Han to order a drink, you’ll have to do some custom work to make it large enough for Luke and Obi-Wan to get into an altercation with Ponda Baba and Evazan—neither of whom have ever appeared in LEGO form anyway. The bar is slightly smaller than the one from the 2014 version, but the original 2004 version didn’t have a bar at all. The entrance is quite plain, though the sliding door works well. It is on the same level as the rest of the cantina, so you lose the feeling of stepping down into the seedy underbelly that the real cantina’s raised exit provided. Near the exit the tiny Droid detector is made with three elements and two stickers. A version appeared in the 2014 set as well, though thanks to the front sticker this one is more accurate. Finally, the last section is the alcove where dirty deeds can be done. This section is remarkably good, allowing Han and Greedo to recreate with accuracy their tense negotiations over who shot first. Interestingly, the horizontal band on the walls has appeared in all three sets, but each time in different colors. In the film, it’s a chrome strip similar to what you’d see in a 50s diner with a dark bead along the bottom. The first version used stacked plates of dark red, tan, and sand blue, which was clearly inaccurate on the ordering alone. The 2014 set had just 2 stripes of grey over dark red, which isn’t bad, though grey is a poor stand-in for chrome. This newest version adds a dark tan plate atop the 2014 style. 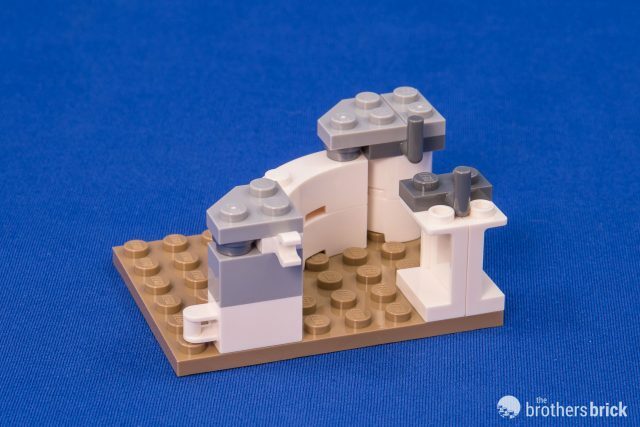 Overall, it’s not a bad solution, but this would have been the perfect instance for LEGO to introduce pearl silver plates. Pearl Silver modified plates exist, but not regular ones (even poor Phasma is relegated to using plain grey) Between Han and Greedo sits the glowing table lights, a detail neither of the previous sets featured. The glowing cylinders are easy to overlook in the film, but the LEGO one here is quite accurate, made of two stacked 1×1 round plates and a 1×1 round tile, all glow-in-the-dark. Lastly, the alcove disguises a play feature. Each of the seats is actually a flipping mechanism to spring its occupant out. 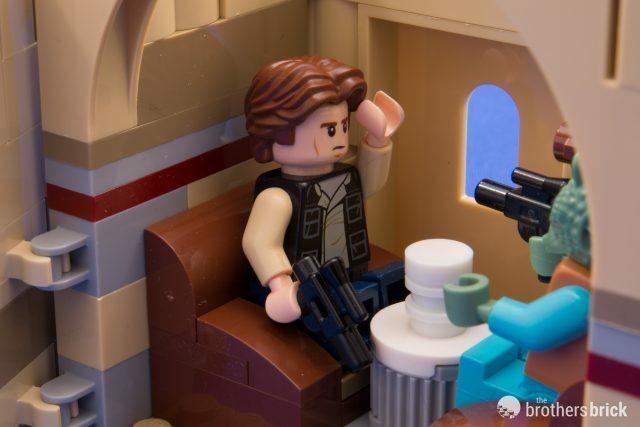 Did Han shoot first? Or did Greedo? Only you can decide which minifigure goes flying! 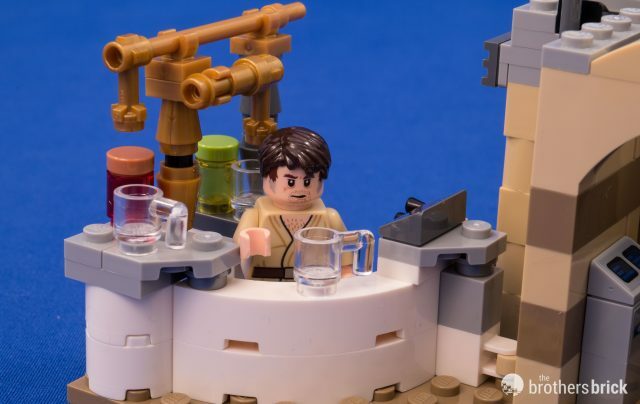 75205 Mos Eisley Cantina includes four minifigures: Han, Greedo, Wuher the bartender, and a Sandtrooper. 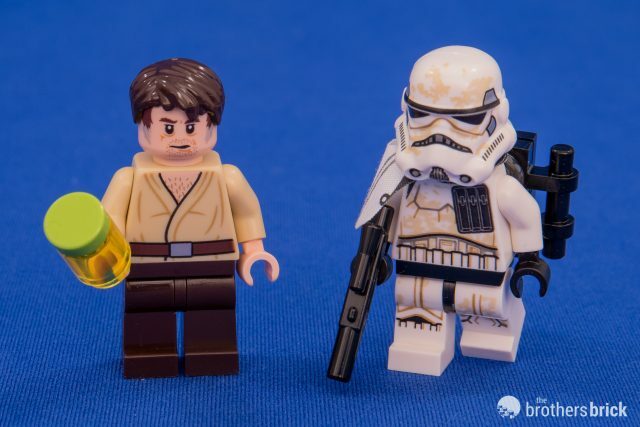 If you’ve got many Star Wars sets, chances are good you already have a Han Solo minifigure. 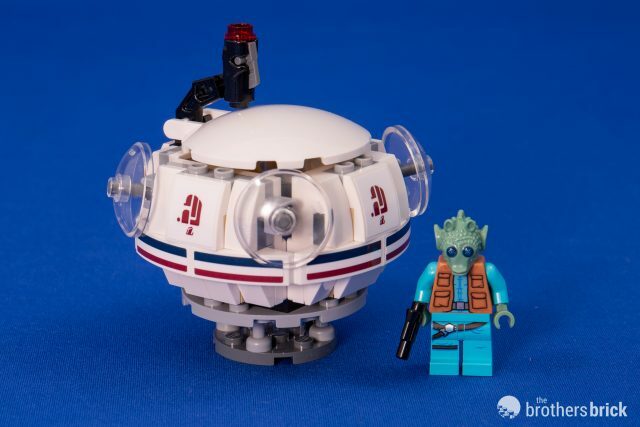 However, minifigure collectors with shallow pockets will be pleased to note that Han is the same version that’s previously only been available in 75159 Death Star, which is LEGO’s second-most expensive set at $500 (behind the new UCS Millennium Falcon). Greedo, on the hand, gets all-new torso and leg printing. The back of Greedo’s jacket has simple seam lines printed on. Sadly both this Greedo and the previous version lack arm printing, which the 2004 version had. 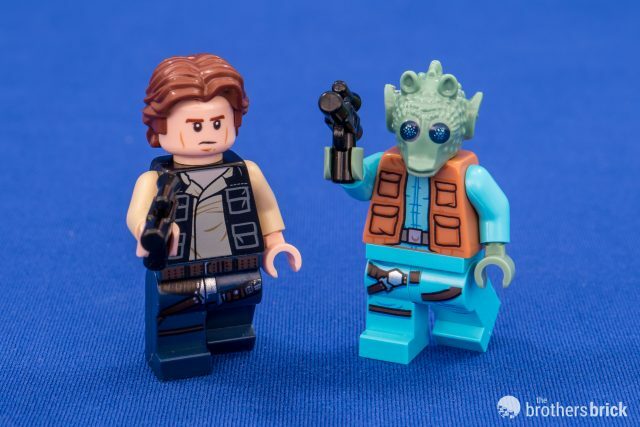 In fact, the 2004 Greedo was one of the first minifigures to showcase LEGO’s new arm printing capabilities. 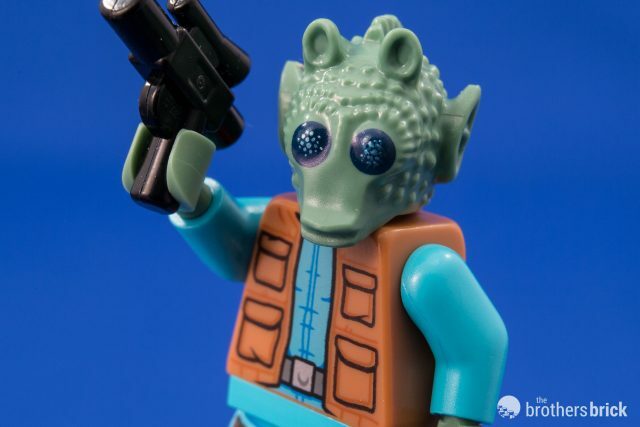 Greedo has the same sand green head as the previous edition, which is only questionably a more accurate skin color than the dark turquoise from the 2004 set. The detailed printing showing the lights reflecting on Greedo’s smooth eyes is quite nice. The only minifigure truly exclusive to this set is Wuher, who has never before appeared in LEGO form. The gruff bartender has a simple cloak and plain dark brown pants. His dark brown hair fades into grey scruff around his face, and lines beneath his eyes show he’s probably been working too long a shift telling droids their kind isn’t allowed in here. His belt extends to the back printing. The Sandtrooper is the seventh version since that first cantina set in 2004, though this one is nearly identical to the one included in the 2014 edition, differing only in the cloth pauldron and accessories. Beneath the helmet peeks the same face as a thousand other infantrymen across the galaxy. 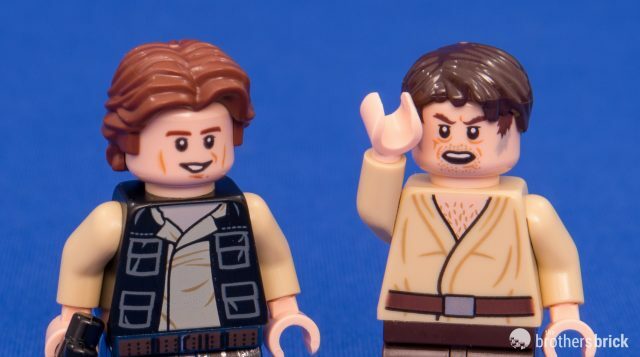 Both Han and Wuher have double-sided heads with an alternate expression on the back—a smirk for Han and an angry shout for Wuher. No blasters! 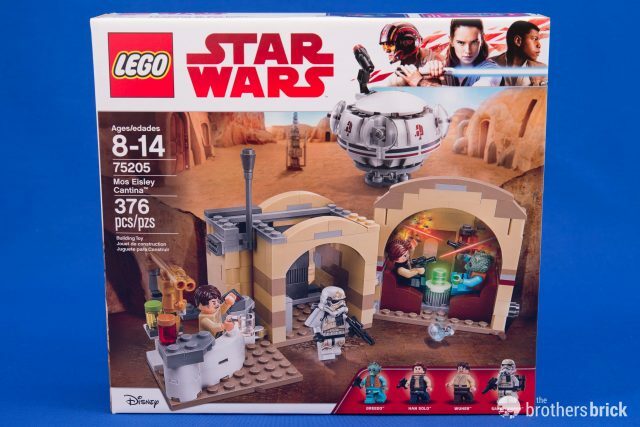 LEGO has taken the previous version of the Mos Eisley Cantina and split it into two sets. Luke’s Landspeeder is now available as a standalone set for $20. 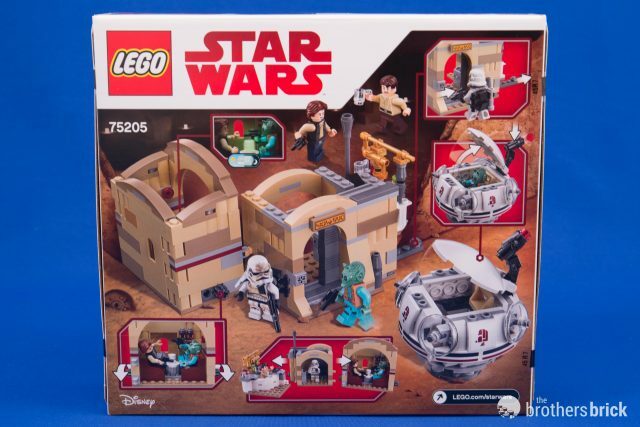 Buying both together brings the total to $60, while the 2014 cantina cost $70, but also swapped the 9000 Z0001 for a larger cantina structure, a dewback, and more minifigures (such as three Bith bandmembers). This may be the third iteration of the Mos Eisley Cantina, but it’s only the second-best. However, picking up an unopened copy of the now-discontinued 2014 version on the secondary market will set you back more than $100, making this set’s shortcomings a great deal more attractive. 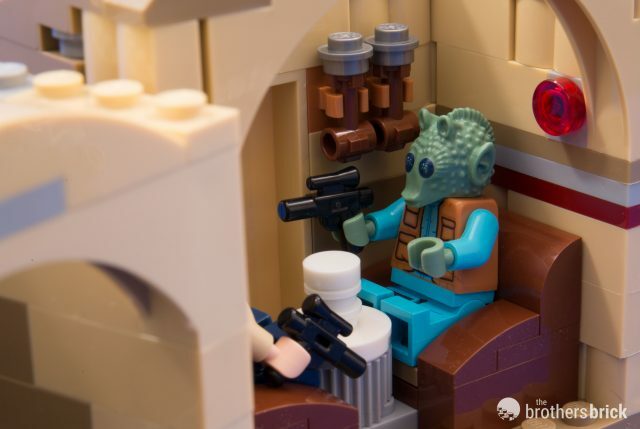 The 9000 Z001 landspeeder is a fun little craft and a must-have for Star Wars fans who enjoy nods to the more obscure parts of the films, and of course minifigure collectors can’t go without Wuher, who has taken 18 years to find his way into a LEGO set. 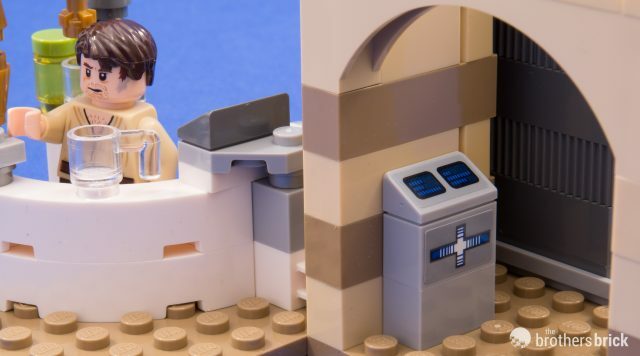 The cantina structure itself, however, is easily forgettable and I suspect many fans will want to customize it to make it at least as large as the previous version. 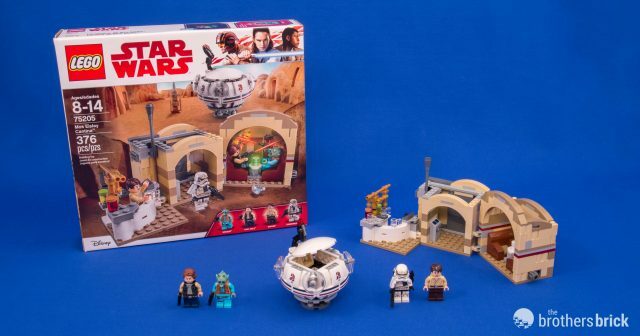 The $39.99 retail price initially feels a bit high for a small structure, one-man speeder, and four minifigures, but the part count of 378 shows it to be not far off the mark (coming in only a hair above the magical $0.10-per-piece ratio that LEGO sets average). If you have the 2014 version, you’ll need to weigh your choices more closely unless you find a sale. If you only have the 2004 version, or don’t have a Mos Eisley Cantina at all, you’ll definitely want to pick this up. 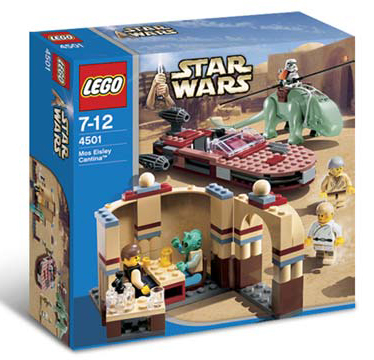 75204 Mos Eisley Cantina will be available Jan. 1 from the LEGO Shop and Amazon.com for $39.99. 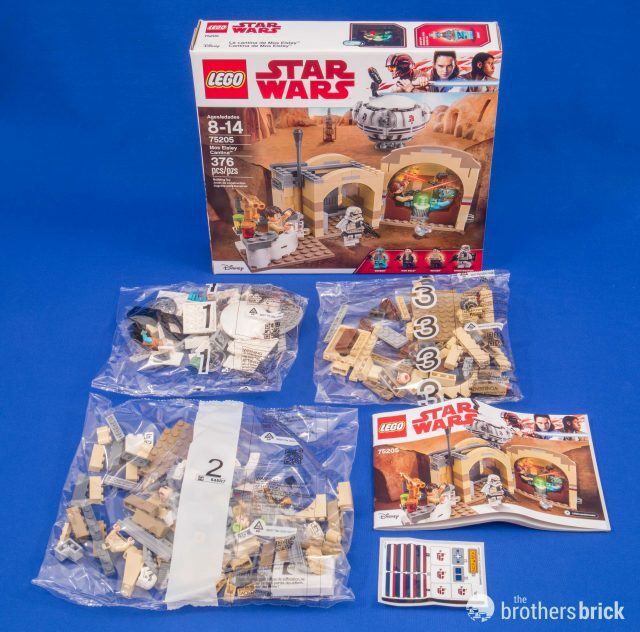 The set is also available early from sellers on BrickLink and eBay. I don’t think the object by the exit is a jukebox, I think it’s a droid detector, ready to cue up Wuher’s most famous line. That uBRICKkian looks amazing! A bit on the pricey side. Will definitely consider picking it up. I wish it came with atleast one animal. If u look closely there is an antenna blaster looking thing on top. Might actually be a weapon so how could you be so sure of the inaccuracy?